From the outside, Burlington’s Moran Plant is a hulking eyesore, a fenced-off, industrial brick behemoth plunked on the Lake Champlain waterfront like an oversize step stool. Inside — as I learned on a recent tour with Community and Economic Development Office director Peter Owens and Burlington painter Katharine Montstream — it’s a grand cathedral of decay. We stepped onto a catwalk-type mezzanine in the dark, disorienting basement. Below us, several feet of water covered the floor, making it difficult to tell where metal staircases began and ended. There were holes in the walls, archways leading to more archways and eerie, half-submerged pillars. “When you frame it with a camera, it’s an abstractionist’s dream everywhere you look,” remarked Owens. 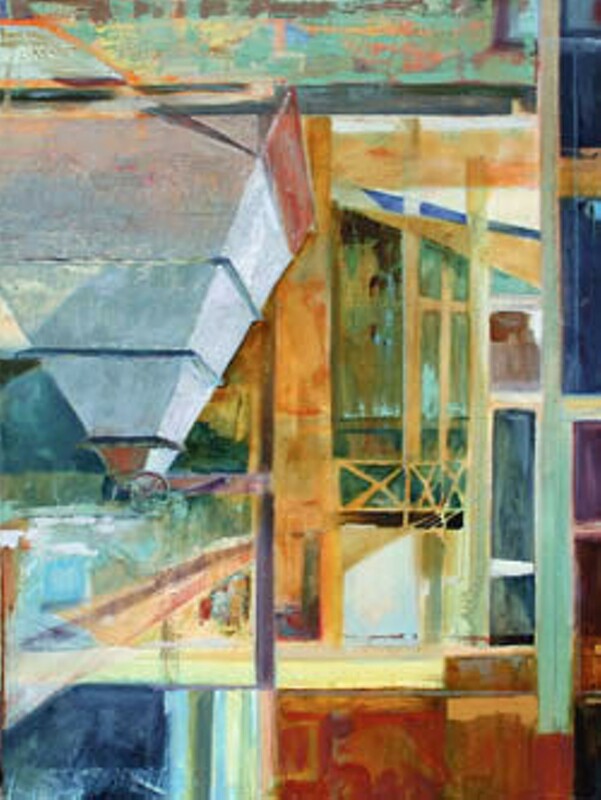 It’s no wonder the Moran Plant has become a source of inspiration to Burlington artists. In a state practically drowning in bucolic landscapes, Moran’s urban decay is electrifying. Over the past several months, at least two local artists have used it as a muse: Montstream and Sarah O Donnell. Montstream, whose paintings of the Moran interior are currently on view at Montstream Studio in downtown Burlington, first got inside the plant last February at a city-organized “Popup Moran” event designed to spark interest in the future of that neglected slice of waterfront. Moran has been languishing for years. At one time, Owens said, there were plans to turn the space into a children’s museum. Just last year, the mayor shot down a proposal to build ice-climbing walls inside. Arts organizations such as the Fleming Museum and Burlington City Arts have long considered using the plant. Nothing has ever panned out. At the February event, Montstream recalled during our tour, a garage door on the back of Moran was rolled up to allow a peek inside the cavernous space, which was illuminated by a temporary light display. 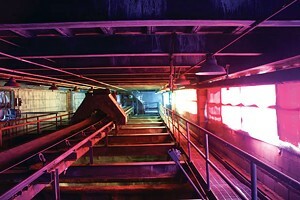 The beams cast mesmerizing shadows on the plant’s gaping interior. “It was astonishing,” she said. Montstream approached Owens about arranging a full tour of the building. He was eager to start a dialogue about the plant’s possibilities and agreed to take her and a few friends inside. Maybe not, but locals familiar with the plant are likely to be drawn to these paintings. Moran may be all chipped paint and concrete floors, but Montstream’s images pulsate with color and life. After the tour, I tracked down Tom Carr, who was the plant’s superintendent from 1968 to its decommissioning. “I’m the last survivor,” said the 80-year-old. In 1977 Carr was involved in shifting the plant to burning wood chips. “We realized that the life of the Moran station was coming to an end for a variety of reasons, most of which were financial,” he said. Burlington Electric Department couldn’t afford to upgrade the plant to comply with more rigorous environmental standards, so its leaders planned a new facility, the McNeil Generating Station. But before ditching Moran, they’d use it as the prototype for a new generation method. Nuclear energy was out of the question. Natural gas was viable, but only in the summer. And coal had become too expensive — plus, the residents downwind wanted relief. BE even considered burning garbage, to no avail. BED discovered it could take advantage of Vermont’s forests and landowners, who were paying $25 an acre at the time to thin their forests to improve tree quality. Carr traveled the country picking up tips at wood-chip-burning power plants and paper mills. Then he and his Moran colleagues jerry-rigged a system for unloading wood chips and hacked together a technique for blowing chips into the boilers. “It was a great place to work. It really was,” Carr said. He hasn’t been inside Moran for at least 15 years and was shocked the last time he walked through. “It was a total vandalized wreck,” he said. If you ignore the creepy raccoon paw prints and the water that glows a nuclear-waste-style green when the sun catches it, it’s easy to imagine future uses for Moran. During our tour, Montstream and Owens rattled off their favorite ideas: an indoor farmers market, a skating rink, a maker space, a hall for wedding receptions. “My first idea was that this would be a bathhouse, like in Budapest,” Montstream said. Owens envisions the Great Hall space as a performing-arts venue with an enormous picture window overlooking the lake and Adirondacks. He’s already picked out his first two fantasy shows: a solo cellist performing the Brandenburg Concertos under a single spotlight; and a dramatic reading of Dylan Thomas’ “Do Not Go Gentle Into That Good Night” by Sen. Bernie Sanders. More community ideas have been percolating since the city put out a request for proposals earlier this year. One of those plans, from a dynamic team made up of two University of Vermont students, Tad Cooke and Erik Crockenberg, and home designer and real estate investor Charlie Tipper, aims to transform Moran into a “publicly accessible, financially sustainable, city-owned and nonprofit-managed” community center. The team hopes to keep what’s good about Moran — its vast interior spaces and great views — and upgrade the rest to showcase local arts and food and create more opportunities for waterfront recreation. Sounds great. But after 30-plus years of stagnation, why should we believe the Moran Plant might be revived this time? We climbed several more staircases to the very top floor, which required walking across a narrow catwalk beside a conveyor belt. We stood above the mouths of the hoppers that once swallowed coal and wood chips. This room has a different vibe now, thanks to Burlington artist Sarah O Donnell and her installation “A Visible Night.” At night, a swiveling light rigged above the hoppers illuminates a rainbow of silk panels hung in the glassless windows. During the day, sunlight streams in through the silk, making the place feel like a nightclub. Our tour wasn’t over yet. Owens, Montstream and I climbed a steep ladder and popped through a hatch onto the roof. Clumps of goldenrod swayed in the breeze. It was like standing on a sky-high pier jutting over the lake. No question, it’s the best view in Burlington. For now, Owens, Montstream and other Moran enthusiasts are taking a new tack: Instead of clinging to grand visions, they’re focusing on identifying the minimum improvements necessary to transform the plant into a “functional ruin.” That’s one way to get people in the door and start their imaginations cranking. The original print version of this article was headlined "Beautiful Ruin."